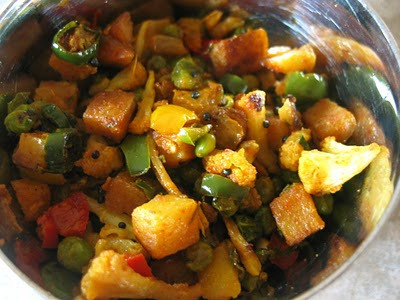 Mixed vegetable sabzi is my favorite winter time recipe. It is very easy and goes well with rice or roti. Ideally here it should be cooked in summer that is when all vegetables used in this recipe are available in farmers market everywhere. But i love it in winter because that is when mom cooked this sabzi in India when fresh peas were available. 1. Heat oil and add mustard seeds. 2. When mustard seeds pop add cumin and cook for a minute. 3. Add potato and cook partially and then add all other vegetables. 4. Cook till all the vegetables are done and serve. perfect way to include all the veggies in our diet..
Wow.. nice curry of all veggies:).. Healthy mix of all veggies!! Love the simplicity of the dish..